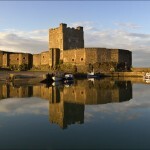 One of the finest Norman castles in Northern Ireland, with views to sea and Mourne Mountains. 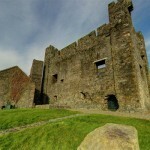 Dundrum Castle was founded in 1177 by John de Courcy, following his invasion of Ulster. 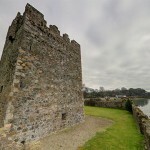 This medieval coastal castle, with circular keep and massive walls, stands on the top of a rocky hill commanding fine views south over Dundrum Bay and the Mourne Mountains in Co Down. Its purpose was to guard the land routes from Drogheda via Greencastle to Downpatrick. It was visited by King John in 1210, who spent money for minor works to the castle and paid for a garrison there. 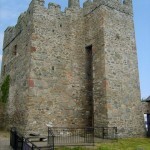 Subsequently the castle was held by the Earls of Ulster and, from the middle of the 14th century, by the Magennises of Mourne. 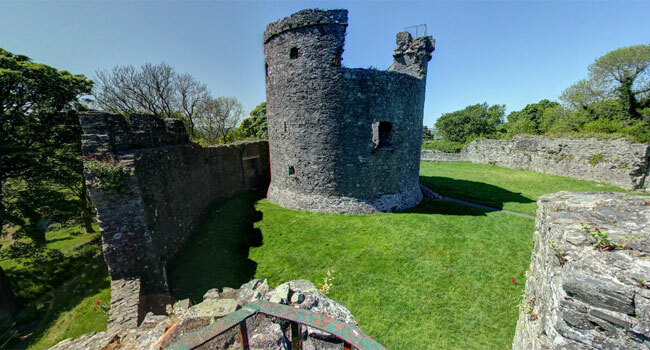 Dundrum Castle is an important historical site in Northern Ireland. 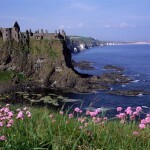 There are other sites linked with John de Courcy are: Cathedral Hill and Mound of Down, both at Downpatrick, Carrickfergus Castle, and Inch and Grey Abbey.